“Stability in Libya means stability in Europe. The European Union must speak with one voice and all our efforts must be aimed at supporting the reconstruction of a state so that it becomes a strong partner. The European Parliament stands by the Libyan people, who deserve peace, stability, democracy and prosperity,” said European Parliament President, Antonio Tajani, at the beginning of his official visit to Tripoli, where he will be received by the Libyan Prime Minister, Fayez al-Sarraj, and by the President of the High Council of State, Khaled al-Mishri. “With today’s visit, I wanted to underline the importance of strengthening relations between the EU and Libya. The stability of this country is essential for the stability of Africa, the Mediterranean and Europe itself. 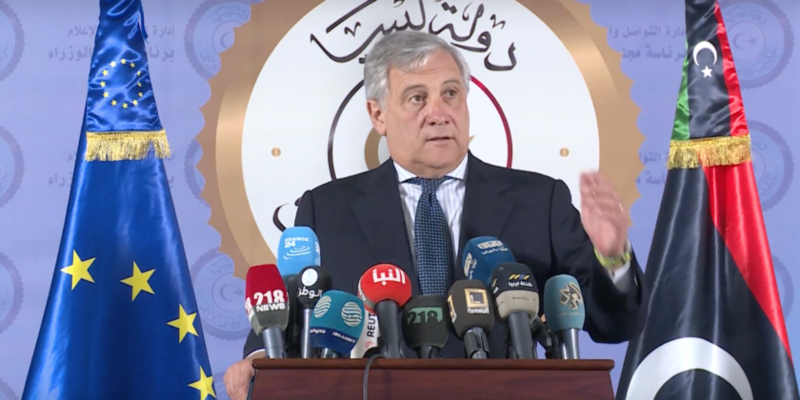 For this reason, we must work together to promote more economic growth and security for the Libyan people and to strengthen institutions, public services and the health service,” the President of the European Parliament Antonio Tajani added at the end of his official visit to Tripoli, Libya. Tajani visited Libya’s Naval Base in Tripoli and other areas, including some migration shelter centers and met with different officials from the Tripoli government to have a panoramic vision on the current status quo.